Isn’t it crazy that most of us are so concerned about how many years we will be left on this earth, when we are not even living sensitively in the time we have now? -Robert Wicks, Seeds of Sensitivity, 50. This morning we continued our 7 Sacred Days series with a focus on Dying Well. Wise and thoughtful Robyn Lewis, pastor at Northpoint, spiritual director and follower of Jesus, died last Friday, and has left a significant legacy for us in her writing. Today four women read extracts from her journals, speaking notes and a personal essay that wowed her marker at the Bible College of Victoria. You can hear the readings on our sermons page (or contact me or one of today’s readers if you’d like a written copy); below are three of the other things we interacted with as part of listening to God this morning: a classic children’s book, a sonnet and a movie clip. 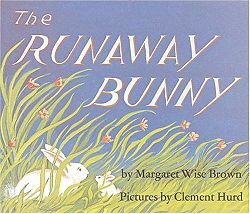 The Runaway Bunny, by Margaret Wise Brown, pictures by Clement Hurd, is all about a little bunny who wonders about running away from his Mummy. The Mummy bunny’s confidence that wherever he goes, she will follow, is a profound picture of God’s commitment to us. The book appears at the end of the movie Wit (based on a play by Margaret Edson), starring Emma Thompson as Professor Vivian Bearing, expert in John Donne’s Holy Sonnets, and cancer patient. I strongly recommend the movie to you ($1 on Mondays at Blockbuster! ); the movie group will be watching it this Thursday at Grant and Megan’s place, 7pm. You can watch a clip of the beginning (complete with Spanish subtitles!) here.